Great win by the Seahawks this weekend! I posted a few photos from the game on Flickr last night before heading back to Montana (check them out here: http://www.flickr.com/photos/bran-dan/sets/72157631931134681/), but I haven’t had a chance to write a recap yet. I’m interested in hearing Coach Carroll’s comments after viewing the film today, so you’ll probably see something in your inbox tomorrow morning. The Seahawks are looking for fans with Seahawks tattoos to kick off a gallery on the website asking more fans for their submissions. If you have a photo you’d like me to forward on to the team, drop me an email and I’ll pass it along. One they have a few photos to get the gallery started, I suspect they’ll take submissions in the same way they’re running the current “Salute to Service” page. I uploaded a few photos from our gallery, but if you have some that you’d like to post, you can upload them here: http://upload.seahawks.com/1326844809. One other question, does anyone know of or host a regular gathering at a restaurant/bar when the Seahawks play on the road? 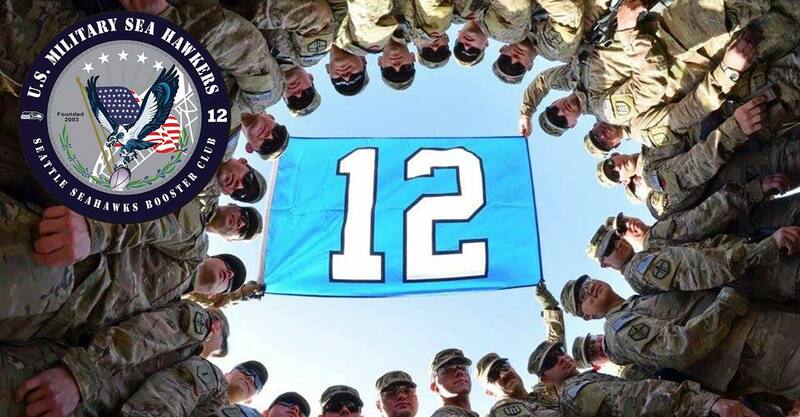 If we were to set up a regular Military Sea Hawkers club gathering somewhere in the Seattle area when the Seahawks are out of town, is that something you would be interested in? If you have any thoughts on potential meeting spots or know of something that’s already going on, drop me an email or comment below. Lastly, I’m going to continue my push for the Seahawks to get picked up as the Fan’s Choice game of the week on AFN. How great would it be to take the top spot for the week of the Military Appreciation Day game against the Jets? Check out AFN’s Facebook page and click on the Fan’s Choice app here: https://www.facebook.com/myAFN.